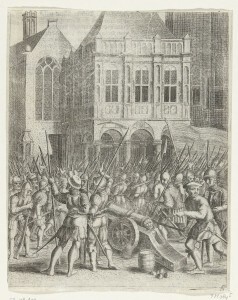 May 10, 2015, is the 480th anniversary of a small Anabaptist attack on Amsterdam’s city hall. The 1535 attack was a late, desperate attempt by allies of Münster’s besieged defenders to force a shift in fortunes. It failed. The small number of attackers caused a scare in Amsterdam, but they were quickly suppressed. 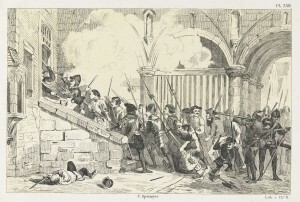 The event helped solidify the popular and official association of Anabaptism with violent rebellion. 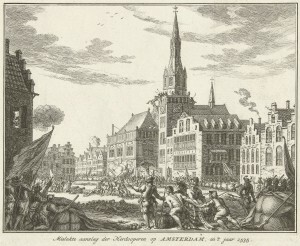 All four images depict the counter-attack of Amsterdam’s soldiers on 11 May against the Anabaptists who had occupied the city hall the day before. Three of the images are from the collection of the Rijksmuseum in Amsterdam, and the other is from the University of Amsterdam’s Special Collections (Doopsgezinde Prenten). They illustrate that this episode in the city’s past continued to capture the imagination of historians for several generations. The first is from an early 17th-century Dutch translation of Lambertus Hortensius’s 1548 anti-Anabaptist polemic. 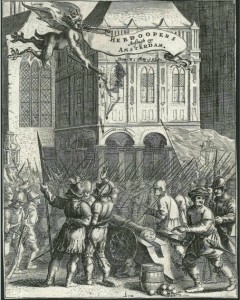 The second is the frontispiece from Pieter Codde’s 1641 anti-Anabaptist play that is focused on the events of May 1535. The third is from the 5th volume of Jan Wagenaar’s 18th-century history of the Netherlands, and the 4th is the 22nd plate from Jacob van Lennep’s 19th-century history of the Netherlands. While Hortensius and Codde were Catholics who viewed the Anabaptists as seditious heretics, Wagenaar and van Lennep were Protestants with personal connections to Mennonites, the descendants of the early Reformation Anabaptists. Mennonite attitudes toward early Reformation Anabaptism deserves more exploration. I will probably write about that subject in later posts.